Even though over 80% of modern day drones rely on RC controllers, there are some of them who work solely through dedicated smartphone apps. This new way of controlling devices over short distances brought new opportunities and ideas to drone market. But, is it an ideal approach to, what seems to be, an already well-established RC technology? Well, in order to find out we need to take a closer look at the differences between RC and phone controlled drones with camera! In terms of actual technology that differentiates these 2 controlling methods, the superior one is clearly full RC control that works over 2.4 ghz frequency. To put it simply, this is because RC frequencies have a much longer range than Bluetooth or WiFi which are 2 most frequently used types of connections with smartphone controlled drones. But, longer range is not the only reason why I firmly believe standard RC drones are indeed superior over their smartphone controlled counterparts. Picture this – you’re flying your brand-new smartphone controlled quadcopter for the first time in FPV mode. You are enjoying the view and casually strolling above your backyard with ease. And then, all of a sudden you lose control of your UAV because you accidentally pressed the wrong axis on your smartphone’s touch display. This is going to happen more often than you’d think. Why? Well, because the feedback of a smartphone’s touch screen is not nearly as coherent as that on a fully-fledged RC controller. It is easy to lose track of where your fingers are located on the screen which is not the case on standard controllers… And that’s why, boys and girls, it is better to have a standard RC controller that gives you full range of movement over all available axis. On the other hand, there are models on this list that rely on both RC and smartphone controls. These types of drones are usually much more expensive than “smartphone only” models… but the price is a proper measurement for quality. You see, these types of drones use RC controllers for accurate tasks such as manual flying, aerial photography… and basically everything that includes human factor. On the other hand, these drones also come with dedicated apps that allow you to use more advanced (frequently fully autonomous) in-flight features. This includes various smart flight modes, GPS settings, telemetry and is generally very helpful in the long run, especially when you get accustomed to the app and you want to get the very best out of your drone. With that in mind, I would like to take you through both of these drone types so you can conclude which one is the right for you! So, without much further adue, let’s dig into the lists! DJI’s newest masterpiece of a drone is called the Spark, and needless to say – it is quite the beast pocket drone. The shipping process has just started after a long preorder period so now is the right time to get one of these bad boys. At the moment, you can buy it in 2 packages. The standard one will get you only the drone while the second one (also known as DJI Spark Fly More Combo) will get you a couple of awesome accessories including the dedicated DJI Spark controller. Additionally, you’ll also get an extra battery, prop guards, charging hub and a tiny shoulder bag for easier carrying (don’t confuse this with DJI Spark cases though, this is a mere carrying bag). When it comes to the drone itself, there’s no doubt it beats all other miniature (selfie) drones on the market. It’s just a tiny bit bigger than your everyday smartphone. 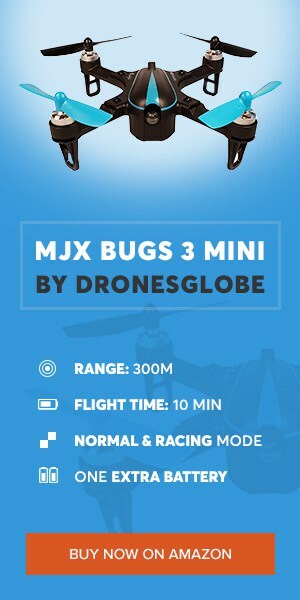 To be more precise, this little fella is 143×143×55 mm and its weight is only 300 grams which makes it one of the smallest drones available on the market. But, despite its ridiculous size, this drone has quite a lot of power underneath the hood. 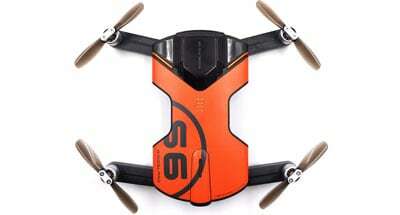 You see, it sports a powerful 1480mAh 11.4V 3S LiPo battery which can power it up to 15 minutes of active flying. While this is nowhere near, let’s say, DJI Mavic Pro’s performance, we are talking about an even smaller drone whose competitors are still nowhere near in terms of flight time. Operating range (when paired up with its dedicated controller) goes up to approximately 2 kilometers which is miles (figuratively and realistically) ahead of similarly sized competition. Camera is breathtaking too. You’ll get a full HD sensor that incorporates an integrated 2-axis gimbal for stabilization purposes. Needless to say, the image quality is brilliant and will make up for great selfies (or even semiprofessional aerial photos) at any given time. When it comes to features that rely on DJI GO app (both iOS and Android controlled drone although you can expect a more fluent experience on Apple’s devices), Spark shines with full light. The main smart features on this little fella are TapFly and ActiveTrack which allow you to set up waypoints for Spark to follow or select an object/person as a point of interest for tracking purposes. Additionally, DJI GO app also allows you to launch and control Spark with your bare hands, allowing for an amazing handsfree experience. With simple gestures, you can control its flight which will serve as a great trick for family gatherings. 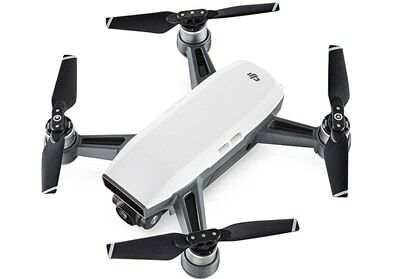 First thing first, Wingsland S6 sports an extraordinary 4K camera that, unfortunately, does not sport hardware stabilization system as DJI Spark. However, 4K resolution beats Spark’s 1080p but the image quality is rather similar. I’d even go out on a limb and say that Spark fares a bit better but solely due to amazing video smoothness provided by its 1-axis gimbal. Moving on, Wingsland S6 can go as far as 100 meters away from the controlling smartphone. Oh, I almost forgot to mention this birdie can be controlled only with the provided smartphone app (Android and iOS compatible). The included 1400mAh 2S LiPo battery is powerful enough to provide with decent throttle. More importantly, it is able to provide around 8 to 10 minutes of flight time. Even though that’s still cca 5 minutes less than Spark, it’s still a good number nevertheless. In terms of features, Wingsland S6 boasts with GPS, omnidirectional obstacle avoidance system, cloud sharing, follow, auto return to home and several other autonomous flight options including, of course, selfie mode. Moving forward to next drone, we have the AR 2.0 by Parrot, a worldwide popular drone manufacturer. This drone looks incredibly sleek and incorporates thick, durable prop guards that are built in around the drone’s frame. Parrot AR 2.0 is controlled with their FreeFlight app… But unfortunately, I have some bad news for you guys. Since Parrot AR 2.0 is a pretty old drone, the folks over at Parrot decided to drop any further updates to their app. This means there will be no more patches available and the current version of the app is as good as it gets. But, there’s a bright side to this story as well. You see, there are good people on the internet who found a way to crack open FreeFlight’s code and change it to their liking. This resulted in support for game controllers (for example PS3 controller) which basically allows you to control AR 2.0 with a fully-fledged controller instead of tapping on your smartphone’s display. Button mapping is completely adjustable and there are several new updates to this modified FreeFlight app. Current version is 2.4.10 and sports plenty of fixes as well as hover lock toggle. Keep in mind that you will have to force install this .apk to your Android smartphone/tablet in order to get it work properly. Luckily, it’s an easy process, in a matter of minutes you’ll be flying your first android controlled drone! Moving forward to the actual drone, Parrot AR 2.0 has a 720p camera which is pretty solid in terms of image quality. With the help of FreeFlight app you can enjoy live FPV stream and record the footage directly to your smartphone/tablet. On the other hand, biggest downside of this little fella is its extremely short operating range (like I already said above, that’s the biggest downside of all smartphone powered models at the moment) of just 50 meters. On the bright side, you can fly this baby around for roughly 10-12 minutes which isn’t half bad. All things considered, even though its outdated, Parrot AR 2.0 still looks like a solid drone, especially if you use that modified FreeFlight app with controller support. Now we are moving onto much cheaper alternatives which, truth be told, aren’t meant for anything but casual flying over your backyard. First in line is Kidcia’s FPV quadcopter that has a lot of interesting features, but doesn’t really perform that well. Why is that so? Well, let’s start off with its features and then we’ll move onto the drawbacks! Features include headless mode which furthermore supports one key return to home function. Don’t confuse this one with GPS RTH as it’s nowhere near as reliable. Additionally, Kidcia also implemented altitude hold feature as well as a really interesting one called Gravity Sensor Mode. 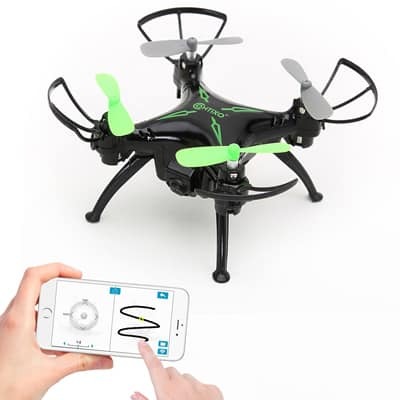 This essentially allows you to control your drone by moving your smartphone in desired direction. But, that’s not all – Kidcia’s drone also possesses Track Controlled mode which mimics Waypoints feature on high end devices, allowing you to draw a path for your drone to follow. And the last “smartphone only” drone in this section of my article is made by Contixo. First of all, I have to mention that this little guy is incredibly easy to fly. 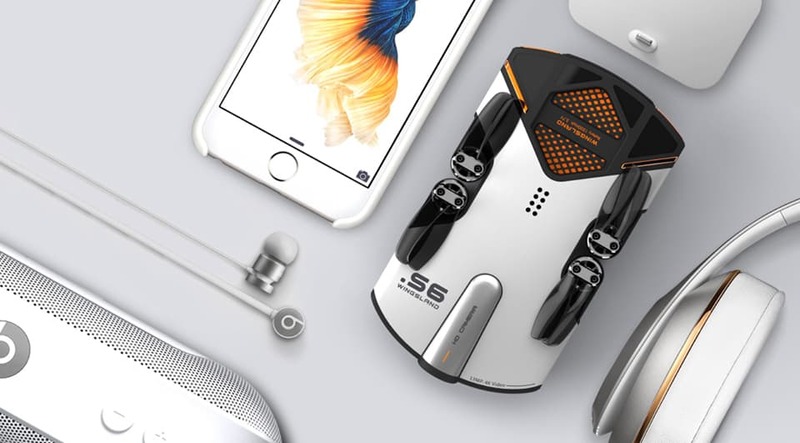 As a matter of fact, its makers are claiming it is the World’s Easiest Fly App Controlled Mini Drone… and believe it or not, that’s not a bold claim. But, is it really the worlds easiest to fly drone? Well, that’s what you’ll be able to find out in the next couple of paragraphs. Quite frankly, this drone isn’t exactly the easiest to fly drone out there since there are high end models that can easily sweep the floor with it. But, for the price it goes for, it is absolutely at the very top. It sports the same track controlled mode which allows you to draw out a flying path but with a really intuitive app supporting it. Likewise, it’s also important to note Contixo features altitude hold as well as one key landing/takeoff functions as well, which make up for an additional ease-of-use factor. One thing that I almost forgot to mention is its miniature HD camera. Interesting fact – it supports FPV but only up to 20 meters. If you think that’s low, operating range is just 30 meters which doesn’t breathe much confidence in its specifications. Finally, we have reached the big guns. First up, we have the amazing DJI Mavic Pro, a small drone that packs quite a bit of firepower. In fact, it packs a lot better hardware than most other big boy drones featured on this list. With that said, it comes as no surprise that it’s priced at a premium price tag too. So, what does it have to offer to its users? First of all, I would like to point out that Mavic Pro, just like all other models on this list, uses both RC and app for controlling purposes. When it comes to the RC controller, it is used for precise movements and photography calibrations both of which have a solid learning curve. On the other hand, DJI GO app works seamlessly with all modern devices with the exception of Windows Phone… but come on, who on Earth uses that anyways… Moving forward, it is also worth mentioning a whole specter of functionalities that are brought to life with DJIU GO app. This is nothing new – DJI GO app is the centerpiece around which all new DJI drones are based. From takeoff, landing, smart flight modes, telemetry (we are talking about really detailed telemetry info) to image adjustments and recognition software… DJI Mavic Pro does it all. Specifications-wise, this little fella can reach up to 7 kilometers and fly for roughly 27 minutes. Needless to say, those numbers are extremely high and put DJI Mavic Pro way ahead of similarly sized competition… and on par with most other big drones out there… And let’s not forget about the 4K camera which serves as a great aerial photography solution All in all, if you are looking for an outright awesome drone and you don’t know which one to go for, DJI Mavic Pro seems like a great option! Next up we have the Solo made by 3D Robotics. This little drone might not be as popular as the other 3 featured on this list, but it sure as hell can perform greatly for the money it costs. While we are discussing its price tag, it is important to note that 3DR Solo is by far the cheapest drone in this list. Both DJI’s model (Mavic Pro and P4 Pro) and Yuneec Typhoon H cost around the thousand-dollar mark while 3DR Solo isn’t shy by being slightly under $250. Yup, that’s right – 3DR Solo costs less than DJI Spark. But, with such a small price tag, can it offer decent performance? When it comes to controlling options, 3DR Solo grants you a responsive console-style controller as well as a dedicated 3DR Solo app for both Android and iOS platforms. With the app, you are able to unleash Solo’s full potential with a wide array of available features. These features include one touch aerial selfies, smart flight options such as Cable Cam, Follow Me, Orbit and more. Tethering process is quite simple and requires only 2 steps to fully connect your drone to the app. In terms of specifications, you can expect roughly 15 to 20 minutes of active flying and approximately 800 meters of operating range. 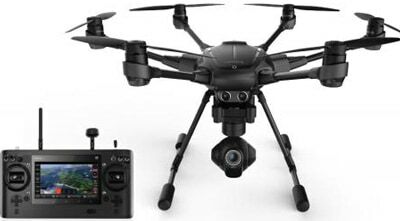 Unfortunately, it does not come with a camera but possesses a GoPro mount (you can even buy a 3-axis GoPro gimbal separately) which will surely satisfy your aerial photography needs. So, with all that being said, at such a low price point, I consider 3DR Solo a proper steal! Now we are going to take a closer look at one of the most underappreciated drones currently available on the market. Of course, I am talking about none other than Yuneec Typhoon H, an outright awesome drone that just can’t get the attention it deserves. If you’re wondering about the controller, I reckon you will be more than happy to know this baby comes packed with Android powered ST16 controller with a fully-fledged 7-inch integrated touchscreen display. With the dedicated app, Yuneec Typhoon H shines in full light since it can do all sorts of advanced flying modes such as Orbit, Point of Interest, Journey Mode, Curve Cable Cam and plenty more interesting features. When it comes to the hardware inside, Yuneec Typhoon H runs on 14.8V 5400mAh Li Po 4S battery which can hold it in the air for approximately 20 to 25 minutes. Additionally, it has 2 kilometers of flying range and is equipped with an awesome 4K camera. Needless to say, this combination of features and specifications is why I believe Yuneec Typhoon H to be an exceptional drone that can make all of you pretty happy with its performance. 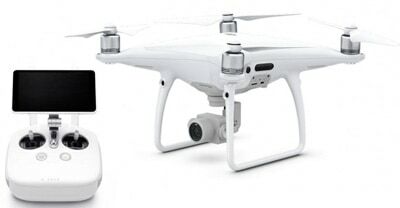 Last but certainly not the least we have DJI Phantom 4 Pro, at the moment the most known drone in the entire world. Without a doubt, I am sure most of you already know your fair share of information about this one. It’s has been receiving a massive amount of publicity through various forms of media so it’s quite a household name. With that said, is it really that good as everyone claims it is? Well, why don’t we find out! As was the case with Spark and Mavic Pro, DJI Phantom 4 Pro also has a plethora of additional features (and in-flight information) available through the dedicated DJI GO app. Of course, it works with both Android and iOS devices (smartphones and tablets) so you’ll be all set to get the full potential out of this bad boy. Likewise, specifications are nothing short of outstanding either. You’re looking at a 5870mAh smart LiPo battery capable of enduring more than 25 minutes in the air which should be more than enough for a fair share of aerial images and/or videos. When it comes to operating range, 7 kilometers is becoming a standard for all premium DJI models so it’s not that surprising to see that number on DJI Phantom 4 Pro. With all that information about phone controlled drones with camera coming to an end, it is time to wrap things up. Even though I’m clearly standing tall on the side of smartphone + RC controlled drones, don’t think that “smartphone only” models are useless. As you already had the chance to see, they’re all incredibly inexpensive (with the exception being DJI Spark which is sort of a hybrid between these 2 types). With that said, it’s only logical to expect they’re not going to be as “perfect” as those premium models from the second list. Both of them have unique uses. While smartphone powered drones are good for children and people looking to get into drone hobby, their high-end RC powered counterparts are good for professional work and more experienced users. So, depending on that, make sure you get this decision right before your purchase as it will greatly affect your drone piloting experience.